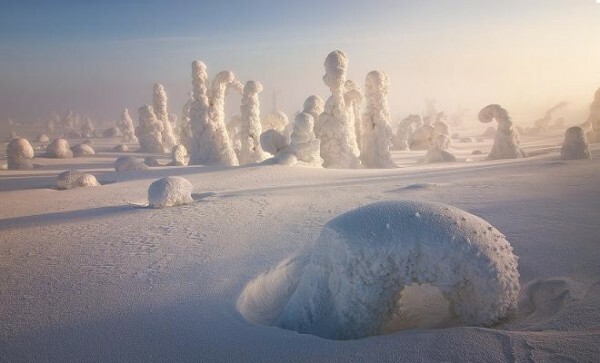 In winters the fields of lapland (Finland), it is common to find such frozen jungles. The plants and trees and the vegetation in the jungles are beautifully frozen as if you are in an alien land. This is a common feature in the Arctic circle area. The temperature remains between-40 to -15 centigrade and one can see such beautiful frozen land sights. 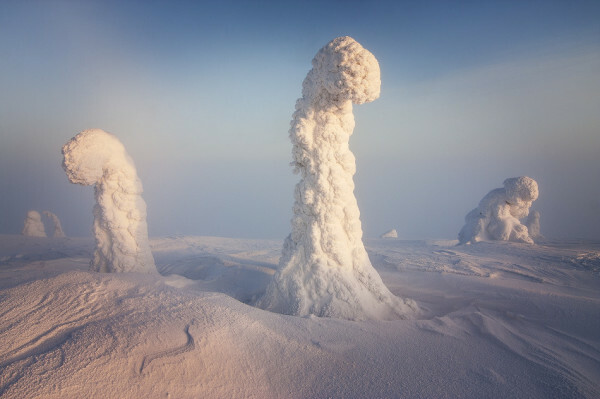 Monza, Italy-based photographer Niccoló Bonfadini was the first to record and see these strange figured trees clad in ice and captured them. While in this Finnish lapland Bonfadini took the snaps when staying outside during the night. The figure seems as if aliens are emerging from the snow ground. The land can be seen and is covered with ice as far as one sees during the sub zero temperature. You will notice that photographer has a very discreet eye to catch the beauty and serenity of the iced vast land. The photographer has a gift of class in his presentation. You can say par excellent presentation!! A frozen alien planet filled with ice worms? That’s what it looks like, and these incredible images were actually taken near the Arctic Circle, where temperatures can fall as low far below zero. For one of the rare shots given above, titled “Sentinels of the Arctic”, he had to wait on the top of a hill for sunrise, and found a light mist was beginning to form around the trees, adding a mysterious atmosphere.For him photography is an invitation to go out to explore the nature and environment. His emotions well up and make him one with the nature. Man is just dot in the vastness of nature!